Vehicle exterior – Look it over carefully. Does the paint appear to be original? Are there spots that have been “touched up?” These could signal a prior crash or rust. Oil – Check the dipstick. Is the oil at the proper level and clear? Undercarriage – Ask if the auto can be put on the lift so you can inspect the parts underneath. Previous owner(s) – Ask how the vehicle came to be at the dealership. Was it purchased at auction? What about the prior owner? Vehicle history – Obtain a copy of the Carfax report. Maintenance history – Have routine maintenance tasks been performed on schedule? Any recalls addressed? Have there been any major parts repaired or replaced? Personal inspection – Inquire if it is possible for your own mechanic to provide an evaluation of the vehicle. Test drive – Taking a test drive is crucial, even in poor weather conditions, as you can see how the car performs in less than ideal circumstances. 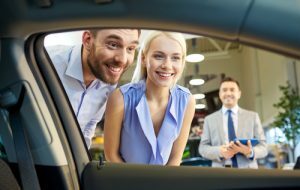 Make your pre-owned vehicle purchase from Carson Cars. We proudly offer car financing with any credit and a large inventory of all types of vehicles. Take advantage of our used car tips buying with poor credit in Everett today. Speak with a member of our sales staff at (855)583-9356.